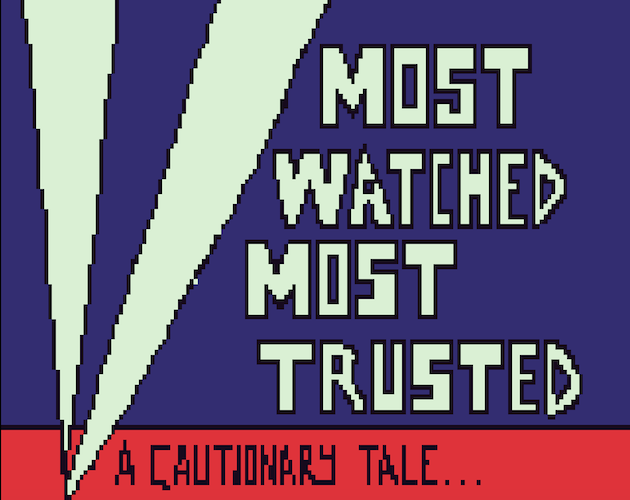 Most Watched, Most Trusted is a short, visual story that explores the ways people can become corrupted by the news media they watch and read. It uses the Flick Game tool to tell a simple, yet interactive visual story about an elderly woman who grows suspicious and resentful of her neighbor after watching too much Fox Tox News. I've wanted to make a game based on this idea for a long time. I just discovered the Flick Game tool a week ago, and I thought I could execute my concept on a very modest, yet still effective scale. The Flick Game tool has a lot of limitations, which made this project fun to conceptualize. You are limited to only 16 slides, which means stories have to be very tightly constructed. As a result, this is a story that you can finish in 30-60 seconds, depending on how long you want to admire my glorious art work. Check out the Flick Game tool at https://www.flickgame.org/. Certain colors on each screen are clickable. Once players click on them, the story advances.